This badge was issued to GILLES TREMBLAY on 21 Sep 2016. 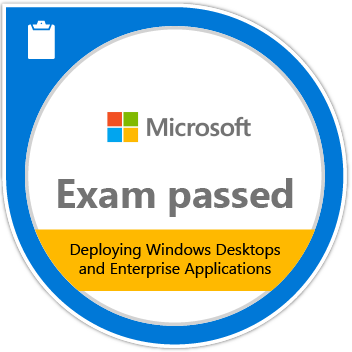 Passing Exam 695: Deploying Windows Desktops and Enterprise Applications validates the skills and knowledge necessary to deploy, manage, and maintain PCs, devices, and applications across midsized to large enterprise organizations. Candidates demonstrate the ability to implement the Operating System Deployment (OSD) infrastructure, a Lite Touch deployment, and a Zero Touch deployment.